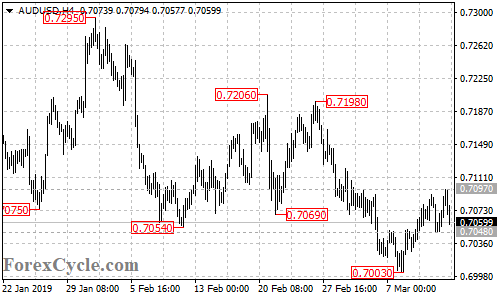 AUD/USD moved sideways in a trading range between 0.7048 and 0.7097. As long as 0.7048 support holds, the price action in the range could be treated as consolidation in the uptrend from 0.7003, further rise to 0.7170 area is still possible after the consolidation. Only a breakdown below 0.7048 support could bring the price back towards 0.7000.